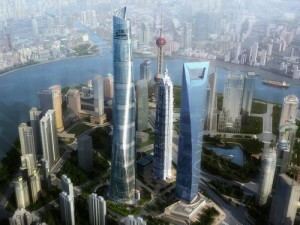 In the late 1990s the Chinese government started developing an area of farmland and countryside on the east side of the Huangpu River in Shanghai, and a few years later it emerged as an upgraded version of Manhattan with skyscrapers built to impress. The entire area is cool looking, but … not very walker friendly. Huge roads (almost) makes it necessary with a car to cross the street, and buffer parks around each building makes the distances even longer. In general, it is actually not a very human-friendly area once you go outdoors. How could it have been if the roads had been put under ground instead? By putting “lowrise” houses and piazzas between the skyscrapers it would have been fully possible to create a pedestrian environment on par with any pedestrianized Italian renaissance city, while still maintaining the skyscraper skyline. Would it have been a lot more expensive to build? Probably not – the average height of the surrounding buildings is around 40 floors, one extra basement area for cars should not matter much. And given the general property prices the additional building space would probably pay for the additional expense on its own. This entry was posted in City Planning, Ultra Compact City Concept and tagged City Planning, Dense Cities, Ultra Compact City. Bookmark the permalink.